As far as plumbing goes, we do it all. From repairs and replacements, to service on toilets, faucets, water heaters and more, our experts are here to help you with any and all of your plumbing needs. Our company is fully licensed, bonded and insured, and we offer warranties on all of our work. We respond to emergencies quickly and can be on the site of most jobs within one hour. 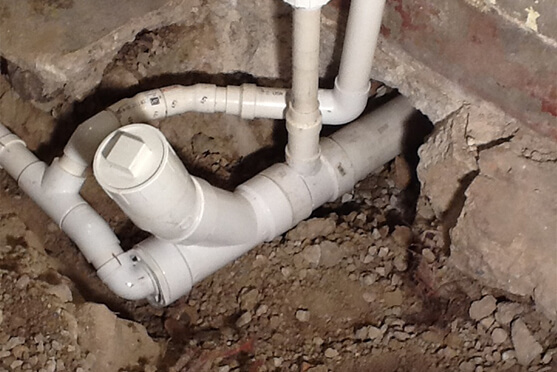 Don't dig up your pipes to fix them, use our trenchless plumbing to build a new pipe within your old one. All backed up? Lets us clear your clogs and get things flowing again. Clogged sink, blocked toilet, we're here to help. Inspect your pipes live, with our TV camera inspection. Find the problem at its source, and get a guaranteed fix. Find your pipes without digging using our electrical pipe locating technology. Keep your pipes clean and clear with our hydro jetting service. The symptoms are all there; recurring clogs, a foul odor and now there’s even sewage backup in the yard. You know it’s time to call a plumber, but you want to keep the costs as minimal as possible, so you decide to skip on the TV sewer inspection. You figure the experts will be able to tell by the symptoms and are happy with your decision; until a month later when the problem is now even worse. Think about it this way, would you let a doctor operate without running tests first? You may have symptoms of a dizziness and chest pain, but that doesn’t necessarily mean you’ve had a heart attack. The same goes for your pipes. There are numerous causes for a clogged or cracked pipe, and uncovering the root of the problem will lead to a better- and more cost effective solution. -Tree roots: Tree roots are the number one cause of clogged pipes, especially in older homes. Older pipes are easily crushed by tree roots, but small roots can even infiltrate into the joints of new pipes. Those small roots then grow and eventually clog the pipe entirely. If the tree root has caused severe damage to the pipes, you may need a new sewer lining. If it is small, our hydrojetting service will demolish the root. -Grease: This clog typically happens about 25 feet into the sewage line, where temperatures are cool. The grease begins to turn hard and build up, and over time causes a blockage. One blast from our hydro-jetting technology and your clog will be solved. -Old piping: Pipes older than 20 years can begin to rust, break and cause a build up. At this point, it is best to reline the interior. Our technology will make your old pipes act like they’re brand new. -Obstructed pipe: Debris like dirt, hair or items that should not be flushed cause a clog. With a simple hydro-jetting or drain cleaning procedure we’ll remove the obstruction. When it comes to pipes, don’t play a guessing game. With our high-tech TV sewer inspection equipment we’ll identify the source of the problem and solve it with absolute certainty. If you are noticing any signs that your pipes may be in trouble, call Rapid Plumbing to learn more.